It seems straight forward that a claim requiring two distinct features cannot be rejected with a reference where the Office uses a single feature in that reference to show both claimed elements. Yet that is exactly what examiners (or supervisors) bent on rejecting an application often do, especially in Art Unit 3747. Consider the following PTAB decision reversing such rejections. The case is serial no. 12/737,668, which relates to engine misfire monitoring. 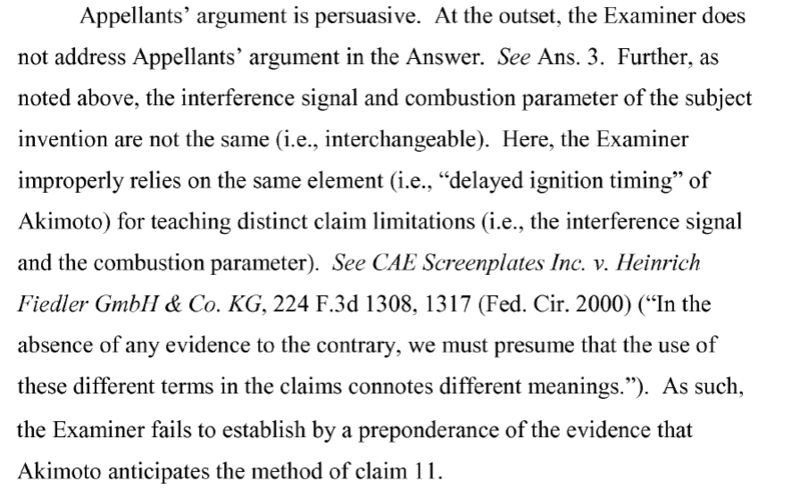 In rejecting the application as being anticipated by the prior art, the Office asserted that the same element in the cited art showed distinct claim limitations of the claimed method. Appellants pointed out this error in their brief, and the Examiner did not even respond to it in the Answer. It is amazing that the Office's quality review efforts have been unable to even identify problems such as this that seem to go on indefinitely and with no consequences. So, when an examiner (and their supervisor) persist in maintaining a clearly improper rejection where a single feature in the cited reference is relied on to improperly show multiple distinct claim elements, do not be afraid to take this issue up on appeal.